The Midterm Assessment: How’s it coming? Every ten years, the National Research Council of the U.S. National Academies brings together a horde of leading astronomers to produce a decadal survey for astronomy and astrophysics. This involves a cacophonous year and a half of panels, agency briefings, teleconferences, and study groups amid a blizzard of white papers, proposals, and town hall reports. In the end the panelists hammer out an itemized list of the next decade’s astronomy priorities which carries an enormous amount of influence in setting federal astronomy-related budget allocations. The latest installment, New Worlds, New Horizons in Astronomy and Astrophysics (Astro2010 for short), came out seven years ago already! Time flies. Before we start thinking about making a 2020 Decadal Report, it’s a good idea to assess how far we’ve come and where we stand with respect to Astro2010. So, through a series of meetings and telecons over 2015-6, a committee of 14 astronomers and 5 staff met to figure out how to “recommend course corrections, where needed, as long as the relative priorities of the [Astro2010] survey were maintained,” and with a view to preparing for the 2020 survey. In this ‘Beyond’ Astrobite, we’ll see some of the highlights of their report, New Worlds, New Horizons: A Midterm Assessment. Unfortunately, a decadal survey cannot predict these numbers. The total amount of funding to federal agencies shift every fiscal year due to an interdependent combination of changes in the economy, voter choices, Presidential budget requests, and Congressional appropriations bills. Priorities within agencies will shift due to changes in the progress of pre-existing projects, international collaborations, or unforeseen scientific developments. Well-timed “course corrections” may be necessary. 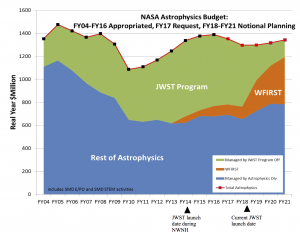 Without adjusting for inflation, Astro2010 anticipated that the NSF’s contribution to astronomy would double over 2010-2020, but the budget has actually remained flat. Something had to give. As early as 2012, an NSF report warned that maintaining the “status-quo approach to AST facilities would be disastrous for U.S. astronomy”. In the meantime, ballooning costs associated with JWST caused NASA to de-emphasize other planned projects (see Fig. 1). The NSF’s flat budget and NASA’s JWST cost increases have been the two biggest shocks to federally-funded astronomy after Astro2010 was published. But it’s not all gloom– some good things have happened, too! In 2012, the National Reconnaissance Office (the suspiciously softspoken satellite spy agency) suddenly donated two Hubble-caliber space telescopes to NASA. 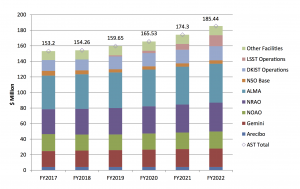 And, despite a generally adverse budget environment, the DOE’s level of funding for astronomy through its Cosmic Origins program has actually increased by more than 50%, without adjusting for inflation. To save money, the NSF has divested itself of some facilities. For example, on Kitt Peak in Arizona the DOE-funded Dark Energy Spectroscopic Instrument (DESI) instrument now occupies the 4-m Mayall telescope, and private money is funding the Robo-AO Kitt Peak project on the 2.1-m telescope. The possible divestment of Arecibo is looming, and Green Bank and the Very Large Baseline Array are now being operated under agreement by a contractor. The Midterm Assessment found that these divestments are indeed necessary to protect both large projects (see Fig. 2) and worthy ‘mid-scale’ projects typically ranging from millions to tens of millions of dollars, such as the Event Horizon Telescope and the Polarization of Background Radiation telescope. Furthermore, there have been cost increases in projects like the Atacama Large Millimeter/submillimeter Array (ALMA) and the Daniel K. Inouye Solar Telescope as they came into operation. The NSF has been unable to play a large role in the Thirty Meter Telescope (TMT) and Giant Magellan Telescope (GMT) projects, so around 20% of the funding for the GMT and TMT is budgeted to come from universities in the U.S., with the rest coming from international partners. Despite making much progress in technology development and some initial construction on-site, neither the GMT nor the TMT are fully funded yet. The TMT has also faced substantial local and legal opposition to its original location on Mauna Kea, which may force it to move elsewhere, possibly to the Canary Islands. The Large Synoptic Survey Telescope (LSST) is a bright area in this report. LSST was the top-ranked large ground-based project in Astro2010 and remains on track due to a stable combination of funding from the NSF, DOE, and private sources. It is expected to begin science observations in 2022. The high-stakes, all-eggs-in-one-basket nature of a space mission means that project costs can easily become unwieldy. JWST was a victim of this and—even though it was the top-ranked item in the 2000 Decadal Survey—narrowly escaped cancellation in 2011. The Midterm Assessment found that the project is currently on track, but that its gigantic share of the pie would continue to force many other projects aside or into the future. For example, NASA-ASD convened Science and Technology Definition Teams to examine the possibility of carrying out exoplanet direct-imaging missions with price tags under $1 billion, as opposed to more expensive ‘flagship’ missions. Also, JWST’s budgetary bulk and the relatively low Astro2010 priorities placed on the International X-ray Observatory and the Laser Interferometer Space Antenna (LISA) gravitational wave mission contributed to NASA’s decision to pull out of the projects, forcing flustered European partners to consider downscaled missions. As mentioned further above, two spy satellites were unexpectedly donated to NASA. (They have been declassified but remain somewhat sensitive— try googling an actual picture of them!) NASA allocated them to the Wide Field Infrared Survey Telescope, rechristening it as the WFIRST-Astrophysics Focused Telescope Assets (WFIRST-AFTA) project. The shake-up gave the project additional time to proceed with substantial coronagraph development and the installation of new, large-format infrared detectors. 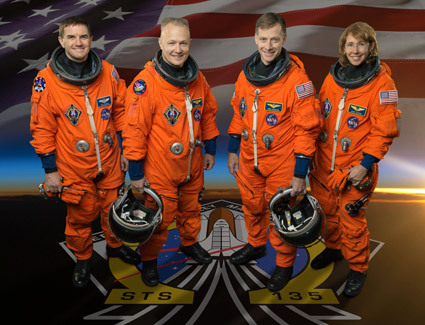 It’s great to squeeze more science capabilities out of a space mission like this, because the long development times often force space missions to launch with somewhat antiquated technology (for example, the Hubble Space Telescope launched in 1990 with technology from the 1970s.) But this came at some additional cost and risk to WFIRST-AFTA. The Midterm Assessment reflected excitement about the additional science to be accessed, but raised the sobering point that the increased costs “would limit options for the next decadal survey” and that cost increases above $350 million could threaten other Astro2010 priorities. What steps should be taken next? The Midterm Assessment explicitly recognized that funding for giant, scientifically promising facilities will consume a lot of NSF resources that would otherwise go to a larger number of smaller programs (as Fig. 2 makes clear). In the Assessment‘s view, the science that these giant projects will be able to perform makes this painful measure worth it. Even though Astro2010 and the Midterm Assessment do not directly address ground-based gravitational wave detection, the Assessment uses their 2015 detection by the Laser Interferometer Gravitational-Wave Observatory (LIGO) to re-emphasize the scientific importance of LISA. The panel calls for NASA to re-engage with the European Space Agency and play a role in the full-scale LISA project, beyond the ongoing shake-down LISA-Pathfinder mission. The Midterm Assessment wants to avoid delaying WFIRST-AFTA, even as the hulking profile of JWST lumbers ahead and sends smaller projects scurrying out of its way. This is in part because the panel finds that WFIRST-AFTA could provide great synergy with JWST observations. But it also calls for an independent assessment to remove some of the uncertainty surrounding WFIRST-AFTA’s future budget, while keeping a sharp eye on the coronagraph. The committee also thought that the new exoplanet science to be had with WFIRST means that large amounts of additional space-mission funding should be directed towards gravitational wave missions instead of exoplanets. If seven years passed by this quickly since Astro2010, it won’t be long at all before the 2020 Decadal Survey is upon us. Despite the belt-tightening across various agencies, the scientific outlook for various fields in just the next few years is bright: ALMA is already yielding unprecedented insight into protoplanetary disks; gravitational wave research will undergo transformative progress via cosmic microwave background experiments with the Dark Energy Survey, Dark Energy Spectroscopic Instrument, and the Hyper Suprime-Cam, in addition to LISA-Pathfinder; exoplanets will see major advances through the K2 mission and the Transiting Exoplanet Survey Satellite; Hubble and Spitzer observations will push galaxy surveys to yet higher redshifts; LSST will near completion; and the forever-unlaunched JWST should finally be launched. We need to negotiate the next few years until 2020 as wisely and skillfully as possible.